Consumers and businesses will shell out big for the upcoming Super Bowl on Sunday, Feb. 3. The National Retail Federation (NRF) expects total consumer spending of $14.8 billion, which accounts for $81.30 among average adults tuning in for the big game. NRF said average spending is on par with a year ago and is the second-highest in the history of the survey. The record average was set in 2016 at $82.19 per person for a total spend of $15.6 billion. The survey found the biggest spenders are consumers aged 35-44 doling out an average $123.26. Boomers age 65 or older are the smallest spenders at $40.97 per person. The biggest average spend ($94.89) is in the Northeast with a team represented in the championship game. In the west, viewers have an average spend of $84.01, also with a team represented this year. The South and the Midwest regions the average spend is $79.09 and $69.24, respectively. NRF said the survey was conducted in early January before anyone knew which teams would be represented in this year’s Super Bowl. It is estimated that 72% of adults plan to watch the game, down from 76% last year. Of those who plan to watch, 79% are purchasing additional food and beverages to eat before, during and after the game. About 10% said they purchased team apparel and accessories and 7% said the spent money on party decorations. Aside from food and beverages, retailers from Walmart to Best Buy have promoted big screen televisions ahead of the game. Roughly 7% said they plan to purchase a new television before the game and 4% said they will buy furniture such as a home entertainment center. Fayetteville-based Field Agent conducted a consumer survey about shopper intentions for this year’s Super Bowl. 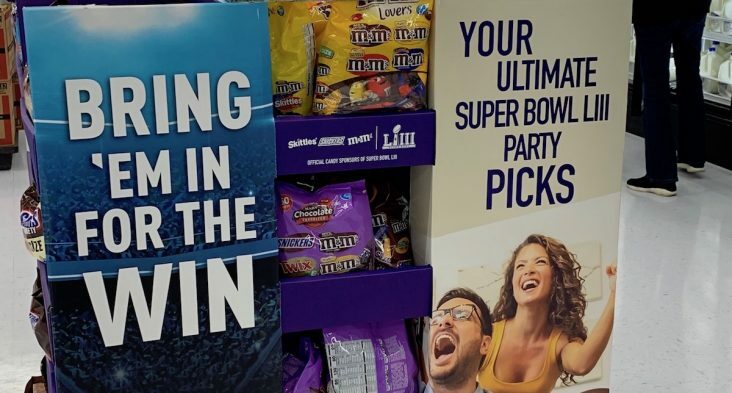 “We asked this group of 3,126 shoppers how they plan to obtain food and beverages for Super Bowl LIII. While the vast majority, 90%, mentioned they would do so by shopping in stores, 15% indicated their game-day groceries will be acquired, at least in part, via in-store/curbside pickup, and 6% said the groceries will be delivered to their homes,” noted Field Agent’s survey. Almost half 47% of those surveyed by Field Agent said Walmart is their go-to retailer for Super Bowl munchies, with 11% naming Kroger, 7% for Target, and Aldi and Costco each took 6%. Walmart spokeswoman Raven Washabaugh told Talk Business & Politics the retail giant has several promotions ahead of Super Bowl Sunday, some of which are driven by suppliers, while store managers are also given the liberty to manage and promote merchandise in their individual stores. While there is always a push for electronics on Black Friday, research shows the best deals on big screen televisions is just ahead of the Super Bowl. The two weeks after the Super Bowl is also the biggest return time for big-screen televisions, according to analysts with Kantar Research. Field Agent also reports soda is a popular game-day beverage among its respondents. Coca-Cola garnered 29% of the votes, with Dr. Pepper ranking second at 14%. Pepsi was third at 13%, Mountain Dew and Sprite rounded out the top five with 8% and 6%, respectively. Nearly one in four said they won’t drink soda during the game. The survey found 44% of viewers plan to consume beer during the game. Among the beer drinkers surveyed 9% said they will choose Bud Light, 7% will stick with local or regional brands, 6% prefer Corona, and Blue Moon, Coors Light, Michelob Ultra all tied with 4%. Field Agent found the salty snack favorite among consumers are Doritos (22%), Tostitos (19%), Lays (11%), Ruffles (7%) and store brands 6%. Nearly 95% of those surveyed said they plan to eat chips while watching the game. Nielsen reports chicken wings will again be a staple at Super Bowl viewing parties. Nielsen said frozen, fully cooked chicken wings still have a massive following, but with dollar sales down 7.9% year over year, consumers are signaling they want fresh, be it ones they cook or cooked for them. “The deli counter wings remains a popular option for fully cooked chicken wings (with sales up 15% to $650 million from $565 million last year to $650 million); fresh meat wings have also skyrocketed, with sales up 31.4% in the past year,” the Nielsen blog noted. Nielsen said convenience continues to drive consumer choice. Online wing sales in the seven days leading up to and including the Super Bowl rose from $7.984 million in 2017 to $11.562 million last year, a whopping 45% increase. Grocery stores have been selling more raw frozen and fresh wings than last year with sales rising 13.9% through Jan. 5, 2019, compared to the corresponding 52-week period. Raw wing sales through Jan. 5 were $399 million, up $49 million from the prior year’s period. Fully cooked wings sold in grocery deli departments are also rising in popularity. Fully cooked wings had total annual sales of $1.214 billion, up 3.8% year-over-year. About half those sales were in grocery deli departments which saw a 15% overall sales growth from the prior year. Fully cooked wings sold in the fresh meat department or frozen each saw sales decline from a year ago as consumers are opting for a fresher option. Tyson Foods and other Arkansas poultry companies benefit from higher wing sales amid solid consumer demand which remains high throughout the NCAA college basketball season. U.S. Foods Farm Report ended Jan. 25, noted that small, medium and jumbo wings rose in price over the past two months as processors continue to build inventories for large national promotions. “We can expect this market to trend flat to upward in the near term,” the Farm Report noted.